Background: Atlas were an English Insurer who established offices in Australia about 1890, initially in Melbourne but then later in Brisbane and Sydney. There are records of other offices inc. Perth but these did not seem to have been issued with perforating devices. The application to use this perforating device was made and approved in October 1912. Atlas Assurance merged with Royal Exchange Assurance in 1958 and later in 1968 this company merged with Guardian Assurance and today they trade under the name AEGON (UK). Device: The A device was almost certainly a single head device. Two types have previously been reported but this may have been due to confusion with similar A patterns of Atlas from their Sydney Office. The Brisbane A device was also known to be used on Postage Stamps from 1913-1942 and later in 1954-55. Care should be taken when comparing these A�s to the reference images as the pattern is not truly symmetrical, so if the pattern does not at first match the reference pattern then try turning the stamp over and checking again. Approval for the use of this A device was sought and given in October 1912. User: Alliance Assurance Companies Ltd. Rarity Scale: Numeral 1/- R4, 3/- R4. Background: *1 *2 Alliance Assurance were a large English Insurer that was formed by Sir Moses Montefoire and Nathan Rothschild in England in 1824. The company commenced operations in the Australian market in the mid 1830’s and established agents initially in Sydney, but later in Brisbane, Adelaide, Melbourne, Hobart and Perth. The company grew internationally through a series of acquisitions and in Australia this included the Tasmanian Fire Insurance company in 1892. Device: The Brisbane A.A./Co. device was most likely a single head device. There were similar devices in the Alliance offices in Adelaide and Hobart but these were subtly different. Because these three AA/Co devices are so similar initial reports considered them a single device. 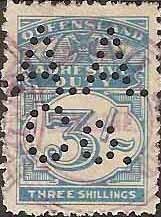 Our research has shown that they are actually three devices and this is confirmed by variation in pin placement that only appears on the revenue stamps of the given States. This is further supported by postmark information on postage stamps. The Brisbane device was also known and used on Postage stamps from late 1930’s to 1946. KEDVII 1901 series 1d, 2d, 3d, 6d, 1/-. 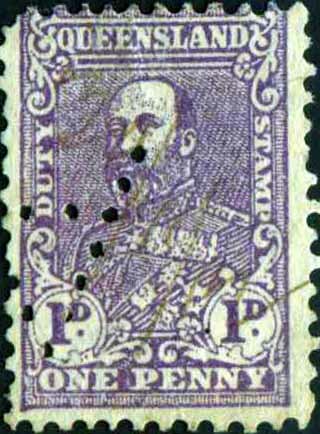 GV 1917 issue 1d, 2d. KEDVII 1d R1, 2d R1, 3d R2, 6d R1, 1/- R2. 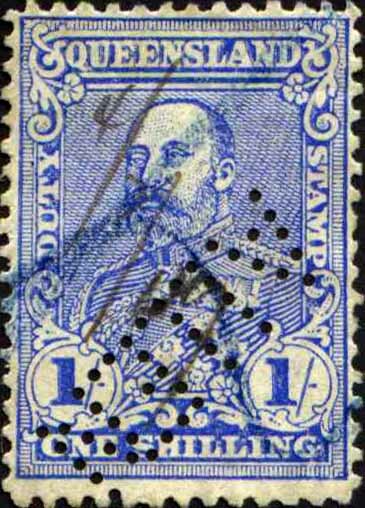 GV 1917 issue 1d R2, 2d R2. Background: *Samuel Allen started out as a produce merchant in Townsville in 1872. The business expanded with new offices in Ravenswood and Charters Towers as well as a series of Hotels. In 1890 Samuel Allen and Sons Ltd was formed and the business continued to grow, particularly in terms of the Hotel industry. The business was eventually acquired by Carlton and United Brewers in 1979. 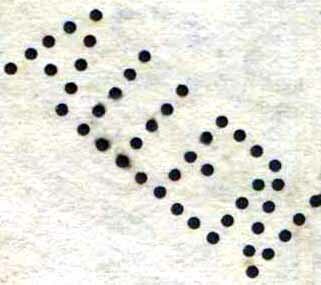 Device: The device was a single head type and was set up to produce a pattern at a 45% angle across the stamp. 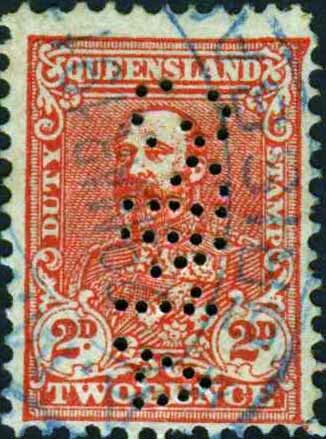 This angled layout is a characteristic of many Brisbane and Queensland patterns such as FINNEYS and some of the BP's of Burns Philip. The application and approval for the use of this perforating device was made in January 1897 and approved in February 1897. This device is also known on postage stamps. * James Cook University Archives. Revenue Use: KEDVII 1901 series 1d, 2d. Rarity Scale: KEDVII 1d R4, 2d R4. 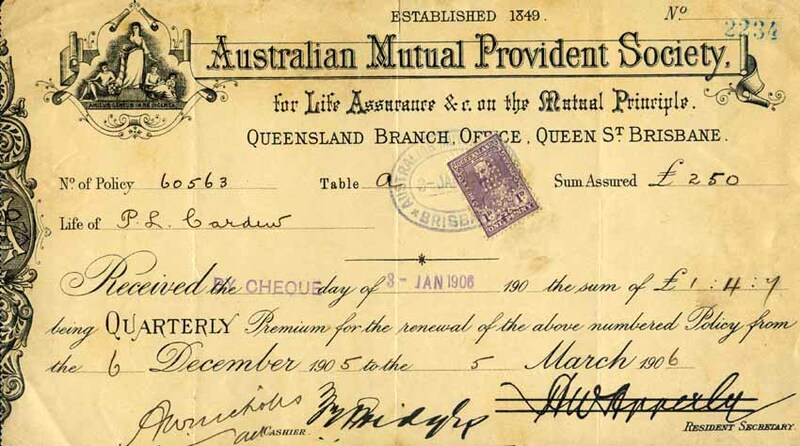 Background: *The Australian Mutual Provident Fund (AMP) was founded in Sydney in 1849 under the recently passed �Friendly Society Act of NSW� for the provision of Life Assurance products. The AMP grew steadily opening a Melbourne office in 1863 and a Brisbane office on the corner of Queen and Edward Streets in 1898, as well as opening offices in New Zealand. Growth continued by the early 1900�s AMP had become the dominant provider in Australia and New Zealand. Device: The Brisbane device was a single head device and was in service from 1913 to c1919. The short period of use seems to overlap the use of AMPS.a and AMPS.b devices and what is more they all seem to have existed in the same office. However the AMP device was definitely a separate device to the AMPSa, b and c devices. This device was also known and used on postage stamps. Brisbane postmarks predominate. Other - Section 2 Commercial Overprints. *History of the AMP � Geoffory Blainey 1998. Revenue Usage: KEDVII 1901 series 1d, 2d, 3d. Rarity Scale: KEDVII 1d R2, 2d R1, 3d R2. Background: See AMP.a pattern above. Device: The AMPS.a and AMPS.b patterns are very similar, differing mainly in the distance between the A and M in each. Also their known usage periods overlap considerably, so it is possible that they are two heads of a multi-head device. Pairs and other multiples would need to be found in order to confirm this or not. AMP are known to have applied and gained approval to use a device of the pattern AMPS in mid 1905. This application was likely for both the AMPS.a and AMPS.b devices which predate the AMP.a device. 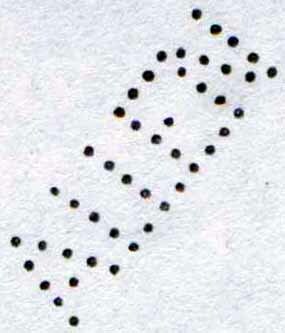 This pattern is found on documents with cachets from Brisbane and Toowoomba. This device is also known and used on postage stamps. 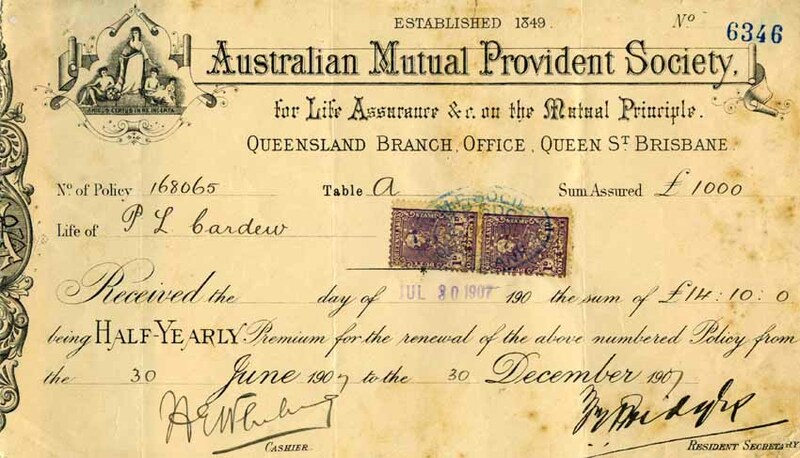 Again postmark evidence supports both Brisbane and Toowoomba use which ceased c1920. 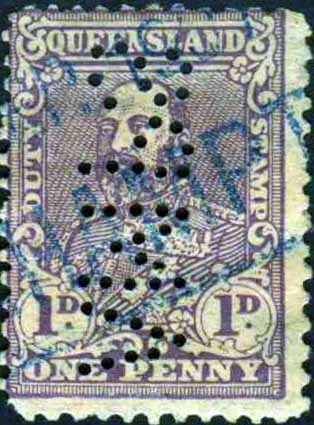 KEDVII 1901 issue 1d, 2d. KGV 1917 issue 1d, 2d, 3d. KEDVII 1d R1, 2d R2. 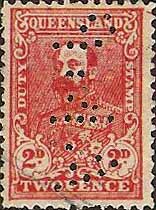 KGV 1917 issue 1d R4, 2d R4 3d R4. 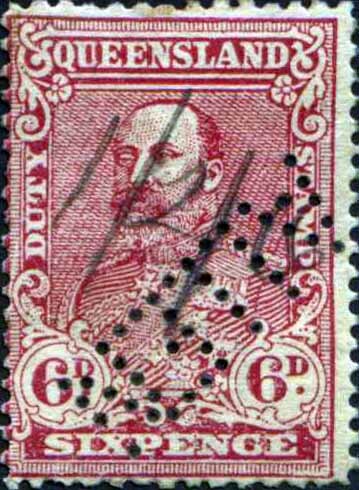 KGV 1926 issue 1d R4. 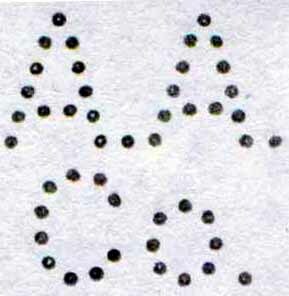 This pattern is found on documents with cachets from Brisbane, Maryborough, Toowoomba and Townsville. This device is also known on postage stamps with Brisbane, Toowoomba and Maryborough postmarks. 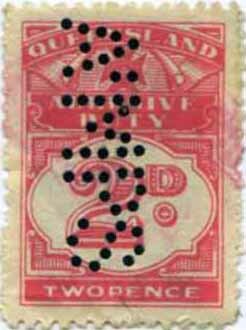 Revenue Use: Numeral 1936 issue 2d. Rarity Scale: Numeral 1936 issue 2d R3. Device: This is thought to be a single head device. The pin locations are very similar to AMPS.a with the same wider spacing between the A and the M but there are 2 extra pins in this gap. The pattern is characterised by thicker pins than those of AMPS.a but it is possibly a modification of the AMPS.a device. This AMPS.c device was short lived and it appears to have been replaced by the embossing and cancelling device A.M.P./Ins. (see below). 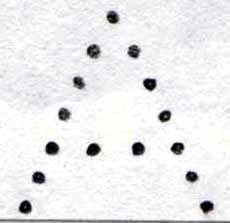 This pattern is only found on revenue stamps and has been found with cachets from Brisbane.